When NPR listeners want to test their knowledge of current events — and laugh in the process — they tune in to Wait, Wait...Don't Tell Me!, NPR's news quiz. 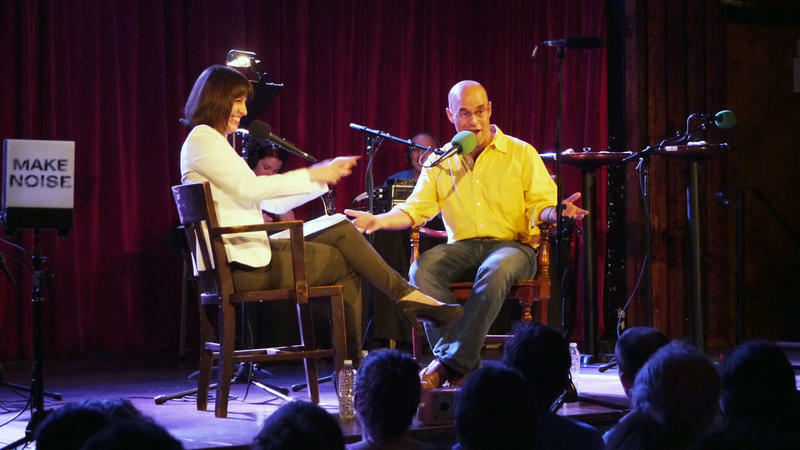 In every episode, host Peter Sagal quizzes panelists and contestants on a smattering some of the week's most oddball events, from the eccentricities of world leaders to failed robberies. We won't tell you what Naughty by Nature was talking about in their 1991 hit "O.P.P.," but that won't stop us from putting our own spin on the three letters. Each answer in this game led host Ophira Eisenberg features the letters "o," "p" and "p" in consecutive order. For instance, the flame-broiled signature sandwich of Burger King is "The Whopper." The hour continues as host Ophira Eisenberg and puzzle editor Art Chung unearth notorious stumpers from the Ask Me Another archives. How well do you know your "qwertyuiop"? We ask contestants to create words using letters found on the "Top Row" of a computer keyboard. Mental math meets pop music in "Algebraic Music" (with an assist from house musician Jonathan Coulton) and the names of esteemed world leaders get reduced to animal-related puns in "Imperial Pets." This segment originally aired on August 30, 2013. This hour, revisit some of Ask Me Another's hardest games with host Ophira Eisenberg and puzzle editor Art Chung. If Nietzsche and Kierkegaard were actually hacky comedians, their jokes might sound a little like those told by puzzle guru John Chaneski in "The Philospher's Comedy Club." Find out from Art the original conceit of this game (hint: it involved people in tights), then try mashing up notable names in "Presidential Middle Names"--it may prove to be more brain-melting than enlightening. According to puzzle editor Art Chung, some games on Ask Me Another are hard because they're created with only one person in mind who can play them: our V.I.P., or Very Important Puzzler. The constant flow of celebrity scandals, blockbuster films and reality TV shows these days can seem overwhelming — and in some cases, quite trivial. So leave it to comedian Julie Klausner to make pop culture relevant. 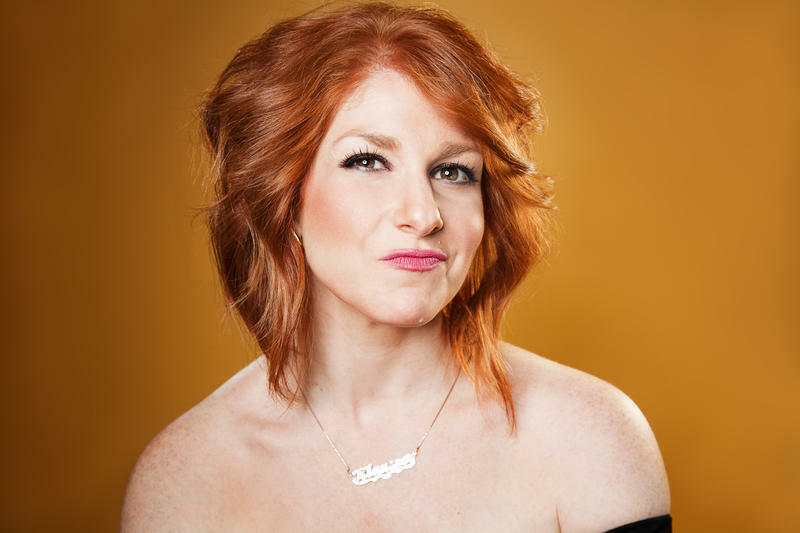 As the media ambassador for Vulture.com, the entertainment site for New York magazine, Klausner recaps shows like The Real Housewives reality series, makes weekly videos on pop culture topics, and appears on TV to discuss what's taboo and what's worth following. Let's say hello to our next two contestants, Mike Blejer and Anna MacEwan. EISENBERG: Hi to both of you. Anna, you are an elementary school nurse. It's been a great time in Boston, but we've reached the Ask Me One More final round. Puzzle guru Art Chung leads the final five contestants in a game comprised of words, phrases and names that begin with the letters B-A-N. For example, the triangular patterned cloth you might wear around your head or neck would be a "bandana," and if it doesn't bear the Red Sox logo, then you're in the wrong town. Jonathan Coulton is wicked stoked to pay tribute to Boston in the best way he knows how: by substituting the names of Boston neighborhoods into the lyrics of well-known songs about other cities. For example, if Elvis had spent more time in a certain Boston neighborhood, he might have written a song called "Viva Dorchester!" Can you name the original towns? Or do you prefer a "Roslindale State of Mind"? It may take a lifetime to develop your fashion sense or signature flourish, but only a few trendsetters can boast clothing items actually named in their honor. And now to end this for once and all, and I mean for this week anyways. Let's bring back our winners from our previous game. We have Olivia Bumgardner from Who's That Girl. Let's welcome our next two contestants, Eden Gauteron and Kiki Turner to the stage. EISENBERG: Eden, you play in a band called Dino's House Party. Why did you name the band that? Let's bring up our next two victims. They are right here. We have Blake Olmstead and Mark Kujawski. Welcome to the ASK ME ANOTHER stage. EISENBERG: Blake, I love that your big hobby is astronomy. Now we're going to crown this week's grand champion. Let's bring back from Breaking It Down, Avidan Ackerson. From Generically Speaking, Erin Barker. From Algebraic Music, Diane Firstman. From Real Housewives, John Rennie. And from Hollywood Formulas Chris Kairalla. If there's actually a secret Hollywood movie formula, we want to see the proof. In a game that will take you right back to your beloved high school algebra and geometry classes, host Ophira Eisenberg asks contestants to combine the titles of well-known movies with mathematical terms. For example, "Rectangled" combines the polygon "rectangle" with the title of the film Tangled. Now, we're going to crown this week's grand champion. Let's bring back, from Six Degrees of Francis Bacon, Christy O'Neill. 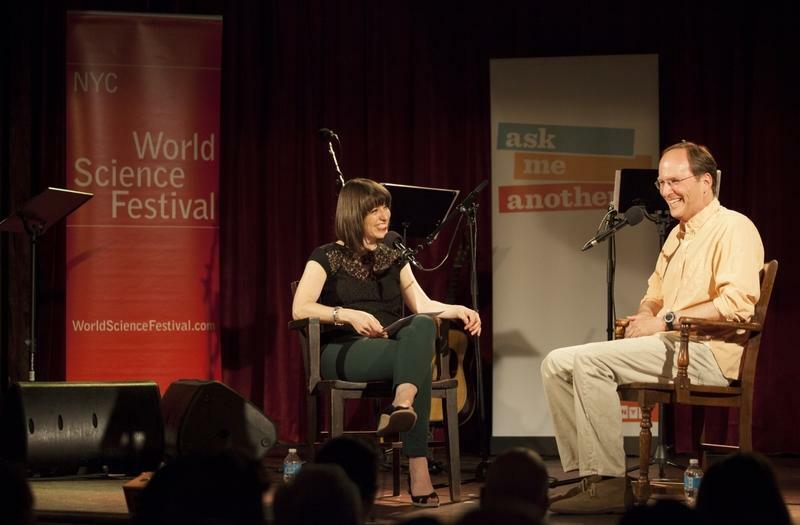 Welcome back to ASK ME ANOTHER, NPR's hour of puzzles, word games and trivia. I'm Ophira Eisenberg and with me on our stage is our very important puzzler, Michael Ian Black. On our stage right now, we have Lauren Weisskirk and Stefan Salva Cruz ready for our next game. STEFAN SALVA CRUZ: Hello, Ophira. EISENBERG: Hello, Stefan. Hello, Lauren. Stefan, do you have a favorite fruit?